Department of Public Safety is investigating the cause of a five-vehicle collision that claimed the lives of a Maricopa woman and two children Wednesday. 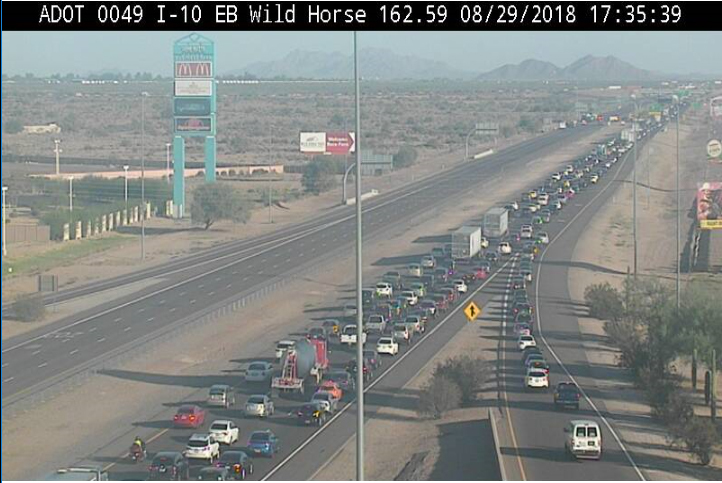 The fiery crash occurred at approximately 9:52 a.m. in the westbound lanes of Interstate 10 between Wild Horse Pass Boulevard and Queen Creek Road. Kim Frankel, 46, who had been a long-time teacher at Maricopa Unified School District, and her two young passengers, described as infants by DPS, were declared deceased at the scene. The roadside tragedy was initiated in the eastbound lanes. A 41-year-old commercial tractor-trailer driver from Mesa was traveling east on I-10 when he veered sharply left for an unknown reason. The tractor trailer struck a Chevy Tahoe, sending both vehicles through the median and over the cable barriers into westbound traffic. Three vehicles, including the Toyota van driven by Frankel, were struck by the tractor-trailer rig. Frankel’s van and the tractor trailer reportedly burst into flames after the crash, according to DPS. The driver of the tractor trailer sustained injuries and was transported to the hospital. Two adults and two juvenile passengers in other vehicles were also transported to nearby hospitals for injuries. The fatal crash shutdown the major artery into Phoenix for the entire day. Westbound lanes reopened around 6:45 p.m. that evening. The DPS investigation is still ongoing.